On February 8, 2017, we launched Managed Disks, Snapshots, and Images, which made it easy to provision and manage disks at scale on Azure. We’re now taking the next step and are excited to announce the Shared Image Gallery, which offers an easy but powerful set of tools to share VM images on Azure. The Shared Image Gallery greatly simplifies image sharing at scale. It’s designed to make it easy for you to share your applications with others in your organization, within or across regions, enabling you to expedite regional expansion or DevOps processes, simplify your cross-region HA/DR setup and more. 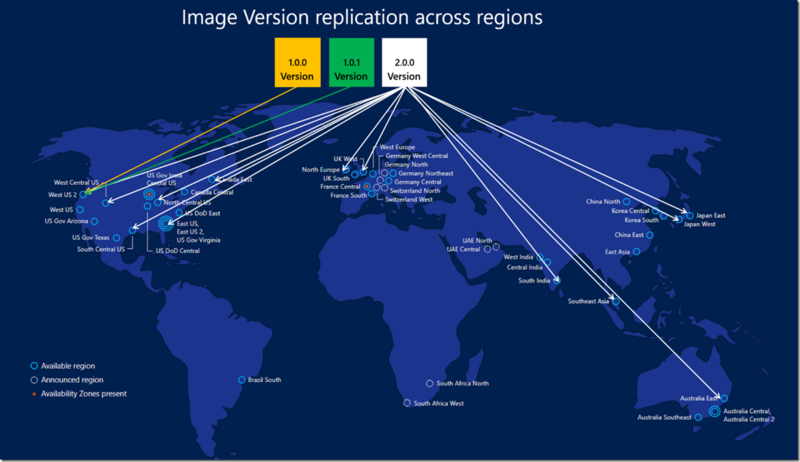 The Shared Image Gallery is now available in West US Central Azure and will soon expand to all Azure regions. We will start sending invitations to join the limited preview on the May 21, 2018. If you’re interested in joining the limited preview, please submit this form to express your interest. How do I use Shared Image Gallery? The Shared Image Gallery lets you choose which images you want to share, which regions you want to make them available in, and whom you want to share them with. You can create multiple galleries so that you can logically group share images. The gallery is an independent ARM resource, and provides you with full role-based access control (RBAC). Images can be versioned, and you can even choose to replicate each image version to a different set of Azure regions. Please note that the gallery only works with Managed Disks. Since the Shared Image Gallery automatically copies your images to the regions you specify, it makes it easy to manage your HA/DR setup. You no longer need to manually copy an image within or across regions, or write your own automation to do so repeatedly and at scale. If you’re selected for the limited preview, we’ll reach out by May 21, 2018 with the details to get you started. Over the next few months we’ll be enhancing the Shared Image Gallery with lots of new capabilities, including scale and publisher control enhancements.